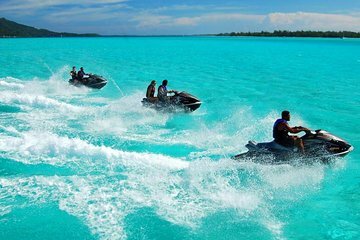 Zoom across the turquoise waters of the Caribbean Sea on this jet ski tour. Choose from 1- or 2-hour tours and ride along the coast of St. Maarten to see famous areas such as The Lowlands, Creole Rock, Happy Bay, Maho Bay, and more. Take a dip in the cool waters and discover the marine life with provided snorkels before ending the tour back at Grand Case.